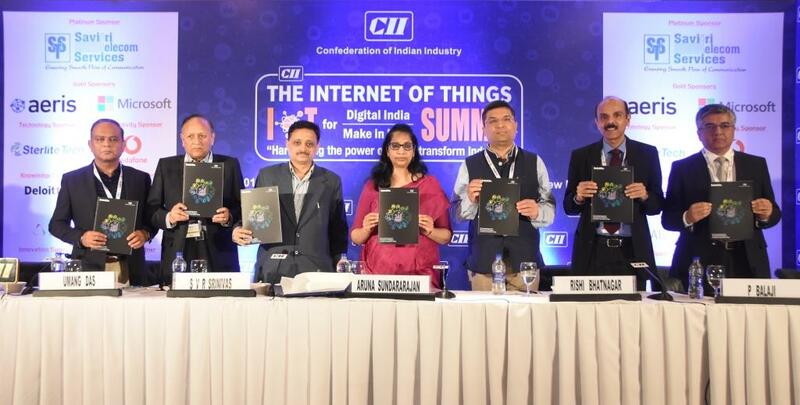 National Telecom Policy (NTP) 2018 will be unveiled soon, said Smt Aruna Sundararajan, Secretary, Department of Telecommunications, Ministry of Communications, Government of India while speaking at The Internet of Things (IoT) Summit organised by Confederation of Indian Industry (CII) today at New Delhi. Smt Sundararajan mentioned that the policy is being framed after a lot of deliberations and opinions sought from the ecosystem, including industry and the regulator. She emphasized that NTP 2018 will be based on three broad pillars viz. core networking & communication ecosystem that will facilitate IoT, IoE & 5G; preparing the rest of the ecosystem to be ready for a new paradigm shift; and how India will position itself as a contributor to IoT & 5G as leader and not just a consumer. Dr Rishi Bhatnagar, Summit Chairman & President, Aeris Communications India in his welcome address emphasized that consolidation of technology; new business model and excellent customer experience are the crux of IoT. He further added that in India, there is a huge business opportunity in IoT, and given the economies of execution our nation demands, it would not be wrong to say that India will soon drive the world market for integrated solutions in the near future. Mr Umang Das, Chairman, CII National Sub-Committee on Telecom Infrastructure said that Infrastructure will play a crucial role for better implementation of connectivity. He opined that India should lead in setting standards for IoT and 5G. Mr Vinod Sood, Managing Director, Hughes Systique in his address said that India is a growing hub for IoT solutions and the Indian IoT ecosystem is rapidly expanding owing to demand by both the industrial and consumer IoT applications. He added that the growth of tech savvy consumers is another drive that is propelling this market. Mr P Balaji, Director – Regulatory, External Affairs & CSR, Vodafone India Ltd said that IoT is becoming ubiquitous and the sophisticated way it is being used is digitalising industries and fundamentally changing the way they do business. Mr Neeraj Arora, Partner, Deloitte India set the context of the discussions through his theme presentation. He mentioned that the IoT industry that will reach USD 15 Billion by the year 2020 will grow to USD 75 Billion by the year 2025. Mr Ravi Shankar Rai, Managing Director, Savitri Group, said that IoT market in India is currently growing & will continue to grow. IoT growth is currently driven by industrial automation, primarily in sectors like Telecom, healthcare, housing, agriculture and engineering, however, the Consumer IoT market is slowly evolving with increasing awareness among people, highlighted Mr Rai. 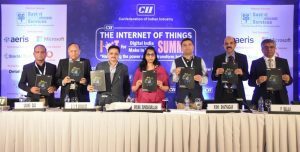 A CII-Deloitte report titled ‘Harnessing the power of IoT to Transform Industry’ was also released during the summit.